Garlicin HC / 90 Tabs - Nature's Way®. 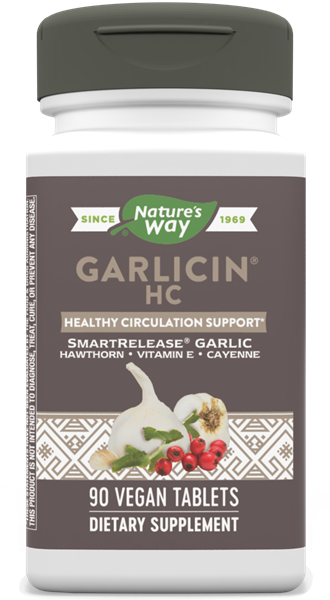 Garlicin® HC Circulation formula combines max allicin potential garlic with the added benefits of Hawthorn, Cayenne and Vitamin E.
Garlicin HC is made from high quality, alliinase-rich garlic powder. Using the SmartRelease® tableting and enteric-coating technology by Nature's Way®, Garlicin HC has stomach acid protection and rapid disintegration in the intestines.